The Seminole Hard Rock Hotel and Casino in Hollywood, Florida is undergoing a massive expansion with a $1.5 billion price tag. 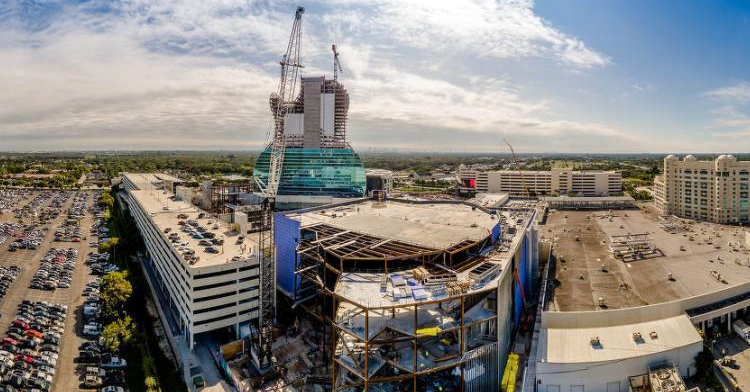 A large, guitar-shaped hotel tower will house 638 luxury rooms and suites, and an adjacent pool tower will contain 167 guest rooms and suites, additional gaming space, 45-table poker room, full service Rock Spa, Hard Rock Live entertainment venue with 6,500 seats, and more. Expected completion date is Fall 2019. At the center of the work is a Liebherr LR 1300 SX crawler crane with maximum load capacity of over 661,000 pounds, maximum hoist height of 554 feet and radius of up to 377 feet. The crane is ideal for lifting and positioning the steel trusses used for this project, each weighing 65,000 pounds. Read the story at Construction Equipment Guide’s website by clicking here. Image above courtesy of constructionequipmentguide.com.